the pink toque. a craft blog: It's Official: I'm Official! So the day we've been waiting 9 months for finally arrived: as of today, May 17, 2007... I am an official Permanent Resident of Canada! As I reported a few posts ago, I received notification at the end of April/first of May that I was approved for Permanent Residency, but today was the actual day I went in to the Calgary Immigration office to be granted the official status. I know there was no reason to be nervous, but my stomach was doing flip flops all morning. I kept worrying that I would forget some important piece of ID, or the photos I had to have done wouldn't be perfectly to spec... I was just worrying that SOMETHING silly would go wrong and they'd reject me. It all went off without a hitch, of course, there was just a lot of waiting. I took a train downtown and met Lucas at his office and we walked to the government building where we waited for about an hour for my name to be called. We spent more time waiting than the actual "interview" took - I basically went into this tiny room to sign papers and that was it. The woman asked me a couple of simple questions, but they were all things that were listed on the document in front of me anyway, lol. I signed everything and she gave me my copy of the paperwork; this piece of paper I will guard with my life, as it is not only a temporary placeholder for the actual Permanent Resident card that I will receive in the mail in a few weeks, but also something I will need to keep for future dealings with the immigration office. This document doesn't guarantee anything for travel purposes, but I'm still taking my trip to Indiana next week. The teeeeeny tiny slim chance they'll give me a hard time once I'm back in Canada on the way home since I don't physically have the card in my hand doesn't really worry me; after all, I am legally a permanent resident now. Worst case scenario is I'll have to spend a little longer in Indiana or they'll scold me and make going through customs once I'm back in Calgary take a little longer than usual, but it's really a non-issue. Nothing we can't handle. It's been nearly a year now since I've seen my family (I hit my year mark just before I leave Indiana to come back), and now that I possess official status, I've gotta see them. I miss my little brother the most, but don't tell him that or I'll totally deny it. You know how it is. So ya, it's been an exciting day! We went to a restaurant called Milestones afterwards; fitting, if you ask me. 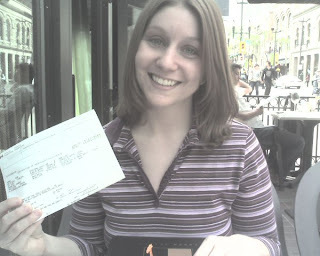 Lucas took that great picture above of me holding up my Permanent Resident document at the restaurant as we celebrated. We came home and celebrated with Oliver, and now we're going out for ice cream! Oliver seems a little confused because we kept telling him he was now officially a permanent dog resident of Canada, but he didn't seem to mind not understanding what we were talking about since he was getting lots of attention over it. "Whatever you say, mom, just keep hugging me!" In the near future our plans include getting me all packed for my trip to Indiana next week; I leave Thursday. Because it's a big deadline, black-out-date period for Lucas at work, he has to wait a week before he can come down, but he'll be joining me in Indiana with my family the following Thursday and staying the full second week with me at my parents' house. Our itinerary is pretty full, and once Lucas arrives, starts off with Tripoly night with my parents and taking Herm out for a belated 21st birthday celebration and college graduation celebration. I can't wait to see everyone!